One of the most beautiful flowered trees in the park is our dogwood, located near the circle entrance to the park, off of Bruce Street. Every year in the late spring, it blooms profusely with its large white flowers. The flowers themselves are tightly clustered, lacking showy petals, but surrounded by four to six large, typically white petal-like bracts. Bracts are actually modified or specialized leaves. The unique fruits are raspberry-like and they persist into winter. They are edible and are sometimes used for making wine. More than 35 species of birds will eat the high-fat, fleshy and red fruit. 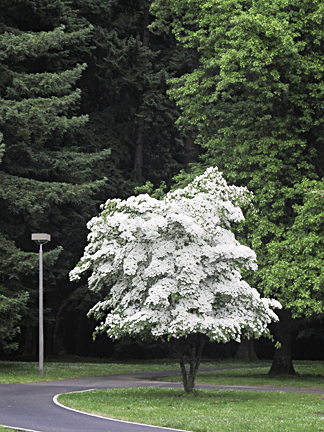 How did the dogwood get its name? The name “dog-tree” entered the English vocabulary by 1548, and had been further transformed to “dogwood” by 1614. There are a couple of theories as to the origin of the name. 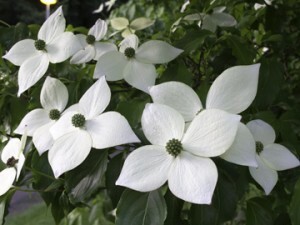 One thought is that “dogwood” was derived from the Old English dagwood, from the use of the slender stems of its very hard wood for making “dags” (daggers, skewers, and arrows). Another earlier name of the dogwood in English is the whipple-tree. A whippletree is an element of the traction of a horse-drawn cart, linking the drawpole of the cart to the harnesses of the horses in file; these items still bear the name of the tree from which they are commonly carved. 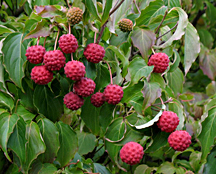 While there is a native Pacific dogwood, our dogwood is of Asian origin.